116 pages | 5 B/W Illus. The Disobedient Museum: Writing at the Edge aims to motivate disciplinary thinking to reimagine writing about museums as an activity where resistant forms of thinking, seeing, feeling, and acting can be produced, and to theorize this process as a form of protest against disciplinary stagnation. 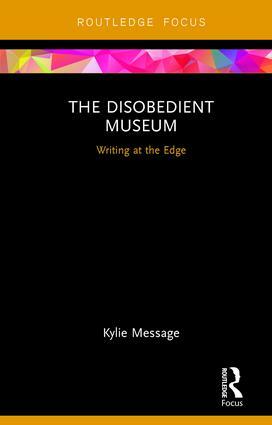 Drawing on a range of cultural, theoretical, and political approaches, Kylie Message examines potential links between methods of critique today and moments of historical and disciplinary crisis, and asks what contribution museums might make to these, either as direct actors or through activities that sit more comfortably within their institutional remit. Identifying the process of writing about museums as a form of activism, that brings together and elaborates on cultural and political agendas for change, the book explores how a process of engaged critique might benefit museum studies, what this critique might look like, and how museum studies might make a contribution to discourses of social and political change. The Disobedient Museum is the first volume in Routledge’s innovative ‘Museums in Focus’ series and will be of great interest to scholars and students in the fields of Museum, Heritage, Public History, and Cultural Studies. It should also be essential reading for museum practitioners, particularly those engaged with questions about the role of museums in regard to social activism and contentious contemporary challenges.